I love Seattle. Everywhere you go, you’re by the water. And you go out of town and you’re in the mountains. Or by a lake. Or a waterfall. Or all three. You can actually do anything. People are kind and outdoorsy. You can do anything! Ski, snowboard, ice climb, hike, run, swim, rock climb, cycle, ANYTHING! Seattle. 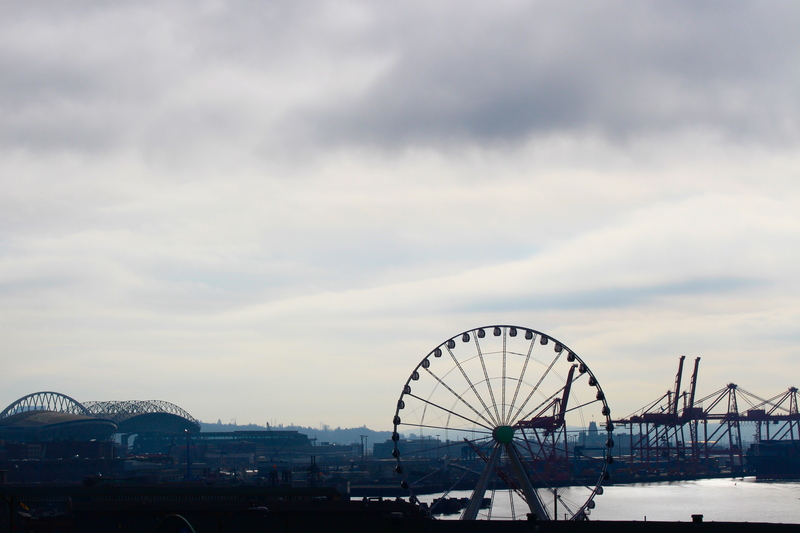 From left: Safeco Field & CenturyLink Field, Great Wheel, and the construction dinosaurs. Good people live in Seattle, I can tell you. My friend Fedya and I visited the market on the first day. It’s touristy, and yet enjoyable. You can buy great food: lots of fish (especially salmon), fresh fruits and veggies, maps, peroshkis, Seattle tchotchkes, and of course coffee. The original Starbucks is in the Seattle market. And man is it crowded with tourists. I’m not a fan of Starbucks coffee, but there’s some pride I feel as a Pacific Northwester in this industry. Starbucks are everywhere, and they began in Seattle. Outside the original Starbucks, at the market. Notice the “12” on the musician’s guitar: he’s a Seahawks fan. We also watched the Seahawks – 49ers game. It was great! Watching the home team win (finally…it was a frustrating game at times) with a load of Seattleites in tow and a cooler of beer in the corner. Man, it was great. 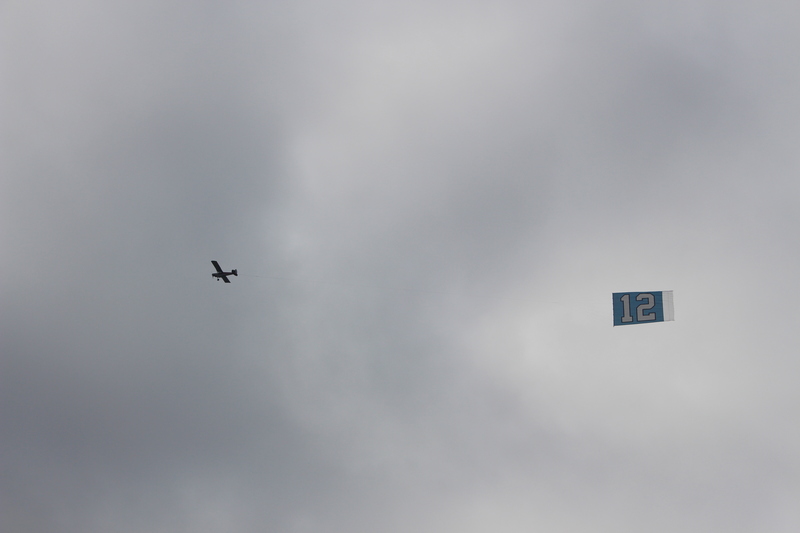 All over Seattle, a blue-and-white “12” is posted. Fedya told me this is because, in a football game, there are 11 players on the field at a time. The fans count themselves as player #12. So by posting these 12s all over town, Seattleites are declaring themselves Seahawks fans. 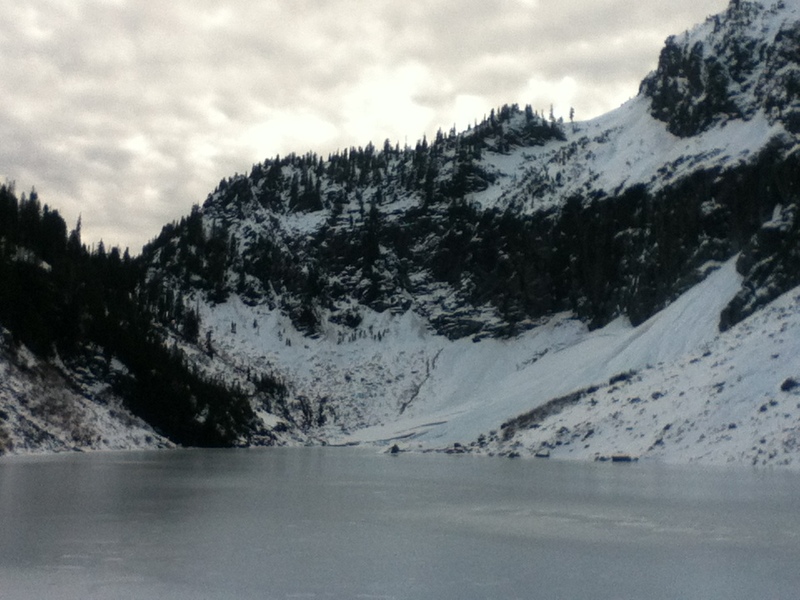 We also hiked to Lake Serene, up at Mount Index. 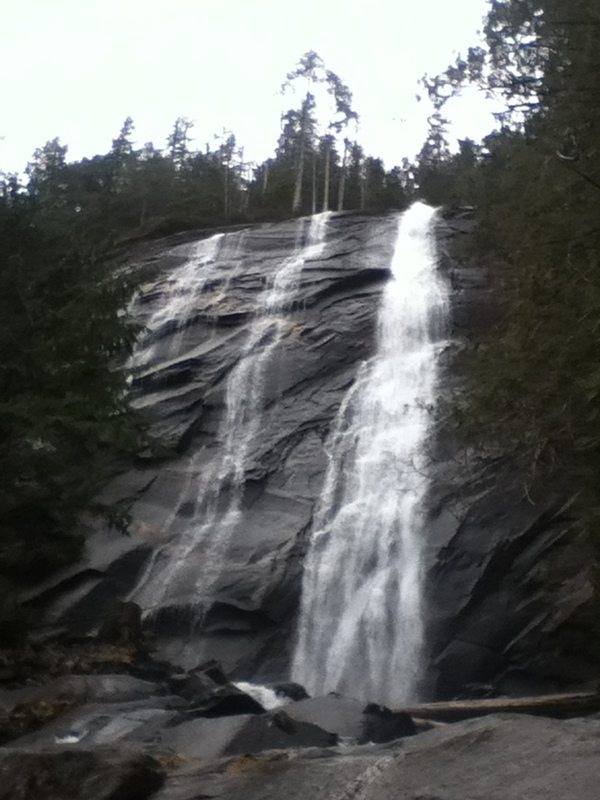 We made a mile detour to see Bridal Veil Falls. The total hike was about 7 miles, with about 2,000 ft of climb. Took about 3 hours with a break for snack and lunch. This hike is about an hour out of Seattle. I’d totally recommend it. The mountains are stunning. Go in early spring. If I weren’t moving out of the US, I would move to Seattle. I am that in love with this place. I barely scratched the surface, and yet I know I could spend years exploring the region.